With a new mid-engine C8 Corvette only a couple of model years away, you would think Chevrolet would rest on its laurels with it’s current well-rounded C7 Corvette lineup until the release of the new C8. 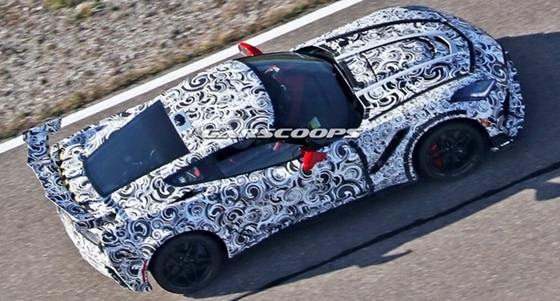 Not Chevrolet, it will be releasing a ZR1 version of the C7 Corvette. 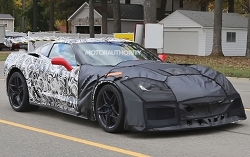 This will be the first Corvette ZR1 since the 2013 model year which happened to be the last year for the C6 and the C6 Corvette ZR1. The 2017 Corvette Z06 is the current Corvette flagship. On the top-end with every option it slightly surpasses the $100,000 mark, its base price is $79,450. The 2018 ZR1 will become the new flagship Corvette model. Its price will start somewhere around $100,000. Many in the automobile press believe the 2018 ZR1 will be the C7’s swan song. We don’t believe that to be the case. Strong rumors have suggested that Chevrolet will let the C7 live on for at least a few model years after the release of the mid-engine C8. It’s a smart move since it will allow Chevrolet to hedge its bets. If the C8 is not well received, Chevrolet will have the C7 to fall back on for sales and it could even develop a front-engine C7 replacement. Or the C8 and C7 may live in harmony over several model years with the C7 being the lower cost Corvette and the higher cost C8 filling the need to fight with world’s best ultra exotic sports cars. For those who think the C7 will be gone after the 2018 model year. Logic should dictate that this would be incorrect. With as tight as money is in auto business these days, it’s hard to believe that Chevrolet would spend many millions of dollars on the development of a low volume C7 ZR1 Corvette for only one model year. The new mid-engine C8 is expected to debut for the 2019 model year. The expensive development of the C7 ZR1 is only really worth the cost to Chevrolet, if the C7 ZR1 is around for at least 3 model years. This gives the C7 a life expectancy through at least the 2020 model year. Now for the fundamentals, it’s quite apparent that the 2018 C7 ZR1 will be a stronger version of the current C7 Z06. The ZR1’s massive hood bulge may be an indicator that the ZR1 will use some form of the supercharged 6.2 liter LT4 V8. The current 650 horsepower rating of the Z06’s LT4 is on the low end of what the LT4 is capable of. Expect the LT4 if found under the C7 ZR1’s hood to have an output of at least 700 horsepower. 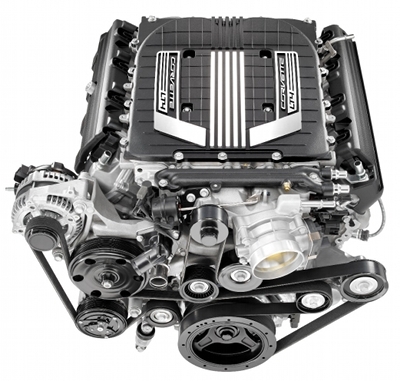 It’s also possible that Chevrolet may release it’s all new DOHC 6.2 liter LT5 V8. This would make sense from a nostalgia point-of-view since the original C4 ZR1 had a DOHC 5.7 liter LT5 V8. If this is the case a normally aspirated DOHC 6.2 liter V8 with 32 valves would be capable of a maximum of anywhere from 500 to 600 horsepower. Only turbo charging or supercharging would increase horsepower past the current LT4’s output. Perhaps Chevrolet has a big surprise and the LT4 will use twin turbos or a big supercharger. The 2018 C7 ZR1 will get it’s own unique front-fascia treatment. There will be more air inlets in the front-fascia than any current C7, to allow for better airflow to the radiator, engine, and brakes. The additional openings will be under each front headlight. 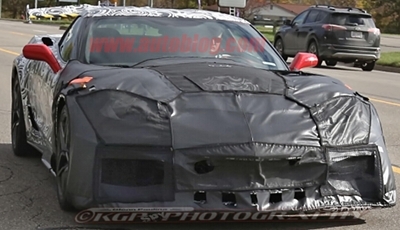 The hood as previously mentioned has a bulge like the Z06 but it’s design appears to be a modern version of the early big-block V8 equipped C3 Corvette’s hood. The C7 ZR1 will get its own unique set of wheels, they have a pattern similar to the stars found on the American flag. The front wheels appear to be 19-inches and the rear wheels appear to be 20-inches. Expect that Chevrolet will take the Corvette’s handling up another notch or two with the ZR1 when compared to current Z06. If the last production ZR1 is any indication, the new C7 ZR1 should be the most capable production Corvette on the race track. Just in case these unique C7 ZR1 items aren’t enough to entice a supercar buyer, the massive boy racer rear wing may do the trick. There hasn’t been a wing this size on a GM production car since the 1988 Fiero GT and Fiero Formula. Surprisingly it looks very good, and it will probably be responsible for a good number of C7 ZR1 sales. It has a tall height so rear visibility more than likely won’t be hampered. Let’s not forget the real reason the spoiler will be mounted to the ZR1’s decklid. With the ZR1 expected to produce more horsepower than the Z06, it’s a safe bet the ZR1 will exceed the Z06’s 205 mph top speed, a massive rear wing is just the thing to keep those rear wheels planted to the ground at speeds over 200 mph. If you want the ultimate C7 Corvette or a race car that can be driven on public streets, the 2018 Chevrolet Corvette ZR1 most certainly will be your next purchase.